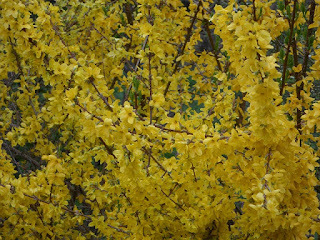 Are you familiar with a forsythia bush? Even if you didn't know the name, you probably would recognize it if you saw one. They bloom in the spring, absolutely covered in bright yellow blossoms. The branches tend to arch out in a fountain shape. Unless--that is--your forsythia is old and has been allowed to grow any which way. Then they tend to be tall, ungainly, sprawling, and perhaps blooming a little at the very tips of the branches. As a sort of "in your face" gesture. Or maybe I'm just imagining the gesture. In any case, there's a forsythia at the very tippy top of our slope that has been bothering me for quite some time. I didn't even realize what it was until this spring (we've lived here for 6 years), when I just happened to notice some yellow blossoms at the tops of its tall, unsightly branches. Here it is, on the right, pre-pruning. Can you see the broken branch leaning way down to the left? It has needed pruning. Badly. Okay, problem: it's not actually our bush. It's very, very, close to our side of the property line, but not there. However, I did talk to our neighbors about it--the ones who are the official owners of the bush. They: 1-didn't even realize it existed and 2--didn't care what I did with it. If your forsythia is healthy and pumping out the blossoms in the spring, STOP! Walk away from the loppers! This is NOT the right time of year to prune forsythias that just need a little maintenance. They flower on old wood, so you would be cutting down next year's flowers if you pruned now. The best time to prune a healthy forsythia bush is right after it's done flowering in the spring. Now, why did I completely ignore that advice? Basically, this particular forsythia hasn't been flowering anyway--so I've got nothing to lose, baby! Also, as I mentioned above, it had one big broken branch and many of its branches were dead from the middle down. Just about anything would be an improvement at this point. Now, I could have just lopped it all off to about 4 inches above the ground and called it good. In another 2-3 years, it would have grown back into a respectable little shrub. However, I could see several newer shoots amongst the old, decrepit branches. See the brown shoots in the picture above, with healthy leaves growing on them? I didn't want to get rid of those! The broken branch is on the left there--if you look closely, you can see where it's splitting. Also, notice how packed the middle of the shrub is--so many branches that you can hardly see what's what. Plan B for rejuvenating an older, unruly shrub like this is to cut about 1/3 of the oldest branches all the way down to the ground each year, for 3 years. Obviously, this method takes a lot longer, but it's less drastic. That ugly broken branch was the first to go, and I actually had to saw it off--it was too thick for my loppers. My, it felt good to get that old boy out of there. To determine which other branches to cut down, I looked to see which had the least amount of healthy growth on them. On many of them, whole side branches were completely dry and could snap right off. Not a good sign! So, I cut down probably 4 or 5 of the worst offenders--all the way to the ground. Then I threw the branches down the hill, just because I could. They made quite a pile at the bottom! You can see that the middle is much more open now, which will help with blooming next spring as the sunlight will be able to reach the branches lower down. I was sorely tempted to chop this thick gray branch as well, but I refrained. I had already taken my quota. Next year, though. It's gone. The forsythia bush, after pruning. 1. My kids were so happy to have a big pile of branches to play with! They immediately started snipping off side shoots for toys and walking sticks and such. This was helpful, as I was able to stuff most of it into the trash can after they were done with it. 2. I am almost 100% certain that no-one else will even notice or care what I did, but that's okay, because it I notice it! Even just getting rid of that broken branch has done a lot for my peace of mind when I look up at the corner. It bothered me every single time I saw it! Do you have a forsythia in your yard that could use a good whacking? If you're local, I'll do it! Ooooh...I do, I do! The forsythia I inherited is a tangled mess that doesn't bloom well, and I've been wanting to do something to it for years now. Come on over any time and feel free to start whacking!